Investment clubs provide a supportive environment where investors can learn how to invest by sharing knowledge and experience, with the benefit of being in a social club with like minded people. Club members typically bring together a diverse collection of people and members take on various roles and responsibilities depending on their strengths and weakness. The Investment club members tend to meet regularly, typically on a monthly basis, to make investment decision, discuss lessons learnt and review past performance. They are typically organised as a legal partnership, however some investment club choose be self-directed, whereby the club members meet each month to discuss investment decisions and thereafter club members invest through their own brokerage accounts, rather than investing collectively. Typically investment clubs have a bank account in the name of their investment club, which requires multiple signatures, where all members pay monthly subscription into, typically via a standing order. Investment clubs have been in existence since the early 1900s, with one of the earliest examples of a modern investment club being the 'Mutual Investment Club of Detroit', which was founded in 1941. The Detroit investment club was established when a group of individuals wanted to invest in stocks, however they did not have the money to do so individually, as trading costs were prohibitively expensive. As a result the group decided to form an investment club so that they could pool together their money to improve their buying power and benefit from economies of scale through lower trading costs per person. The Detroit investment club still lives on and it is said that their investment portfolio is now worth many millions of dollars. One of the earliest examples of a group of people who clubbed together to make investments was an art fund called, La Peau de l’Ours (The Skin of the Bear), that was set up in 1904 by a Parisian art lover called Andre Level. Level persuaded a dozen other art lovers to contribute 250 francs each year to buy modern paintings. In return the investors got to hang the purchased artwork in their homes, for a ten year period, before the fund was cashed in by selling off the collection. Over the 10 years, Level collected work from artists such as Picasso, Matisse and Braque. In 1914 when the First World War was about to break out, the collection was sold. One fifth of the sale was donated to the original artists, and the remainder was divided between the investors, generating them a 4 fold return on their investment. You can only try to imagine what that investment fund would be worth today if they had went for a buy and hold strategy! Social: It is fun and is an excellent way of meeting new people with a similar mind set, while widening your social circle. The main reason that unites all investment club members, is the desire to increase their wealth through investing in companies that will provide capital appreciation and potentially a source of income. Capital appreciation is achieved through increased share prices and income can be generated through dividend payments or investment strategies such as writing covered calls. 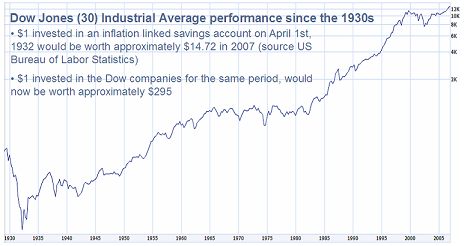 Despite significant stock market crashes over the centuries the stock markets have consistently out performed inflation. Consider the Dow Jones index of 30 fundamentally sound blue chip companies that are listed on US markets. Based on statistics from the US Bureau of Labor Statistics 'Inflation Calculator', if you had simply invested money in an inflation linked investment account between 1932 and 2007, you would would have made a return of approximately 1,472%. Sounds great, however in reality all that you would have achieved is consistent buying power e.g. products, such as for food stuffs, that cost $1 in 1932 would cost $14.72 in 2007 if the price of those products increased in line with inflation for that period. Legal Structure Investment clubs are typically set up as a Partnership with a lesser number of clubs choosing to Incorporate themselves or become self directed. The Investment Club Associations listed below typically provide a standard partnership agreements for investment clubs based on regional legislation. Bank & Brokerage Accounts It is common for Investment Clubs to open a bank account to receive monthly subscriptions from their club members. The bank account typically requires multiple signatures for money to be withdrawn. Periodically the money in the bank account is transferred to a brokerage account to facilitate investments. Unfortunately not all brokers provide support for Investment Clubs that are formed as a partnership, however a list of some of those known to provide Investment Club accounts is shown below. There are a greater number of brokers that accept Investment Clubs that are incorporated, however incorporated investment club accounts typically encore Professional Brokerage and Market Exchange fees, which are significantly higher than non-professional 'partnership' trading fees. Goals & Education When a club is formed it is considered good practice to establish financial goals, an investment strategy and decide on a method of developing an improved understanding of the stock market and investment products that are available. Provide a report on investment transaction since the last meeting, stating the price and total amount. New companies are presented and the current holdings are reviewed. The club should discuss any portfolio changes that the club is going to make. A public or secret ballot vote should be taken on any changes to the investment portfolio. All members must be dedicated to the club's long-term success, therefore need to address their personal growth in investment training. The majority of investment clubs, at least in the United States and the United Kingdom, implement a Unit Valuation System (UVS) to apportion ownership between Investment Club members. It enables club members to make flexible monthly subscriptions (contributions) and withdrawals through the process of purchasing and cancelling units. As a performance metric the Unit Valuation System strength lies in the ability to apportion ownership at any point in time, as club members buy and sell units through making subscriptions and withdrawals. Various software is available to help club Treasurers with managing member subscriptions, keeping track of the unit valuation and generating tax returns.